Please be sure to familiarize yourself with our Terms & Conditions before attending an auction or registering an absentee/phone bid. All of our auctions allow for preview times. 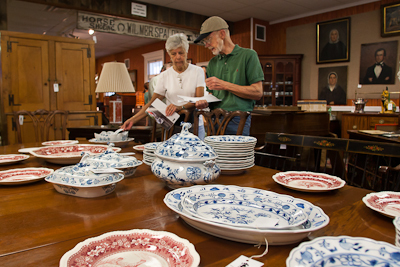 This is when buyers are encouraged to come and examine the items in the auction. If a buyer cannot attend a preview, our staff will give as much help possible over the phone and via email photos. Please note: because all property is sold "as is" it is important that the buyers get a condition report in advance. The most exciting way to participate at auction is the traditional method of bidding live in the salesroom with an auction paddle. Clients intending to bid in person must register for that auction with a photo ID, and a bidder number will be assigned at that time. Once the sale begins, the auctioneer will announce each lot and then open the bidding. Bidding progresses in sequentially higher increments. To place a bid, simply raise your paddle for the auctioneer to recognize your bid. If no one tops your bid, the auctioneer will state that the item is sold, then announce the hammer price and your paddle number. With your written permission, we can act as your representative and purchase an item for you at the lowest possible price. The maximum price you are willing to bid is confidential and will be executed by a Smith representative, alternating your bid against other bidders until the bidding ends. In the event the other bidders drop out before reaching the full amount of your bid, you will purchase the lot at the next increment. Complete our Bid Form, or use our online application to submit your information including your price limit for any specific lot. This should be the maximum hammer price you're prepared to pay, remembering to take into account the additional buyer's premium. You will be required to provide your credit/debit card details, proof of identity and residence if you are registering for the sale. If we receive two bids of equal value, preference is given to the bid that arrives first. A representative from Smith's will contact you by phone to confirm your bid, and will mail out an invoice following the auction if you bid is successful. Clients unable to attend the sale may still participate live at the auction by bidding on the phone with a trained staff member. Unlike an absentee bid, this allows you to place your own bids on a specific lot in real time even though you cannot attend the sale yourself. Phone bids are accepted up until 5pm the day prior to the auction, a form can be downloaded online or contact our office at 603-675-2549 to obtain one. Please note: a valid credit card will be required to reserve a phone line. This will only be used if instructed by the purchaser, though if payment is not received within 30 days of the auction your card will be charged. Overseas bidders and clients bidding from a cell phone may be asked to leave a safety bid which will function as an absentee bid should the call fail. Our absentee/phone bid form may be downloaded here. Unless otherwise specified in the terms for a specific auction, buyers premium is 18%, discounted to 15% with cash or check. All lots must be paid in full prior to shipping.